We investigated whether plasma and synovial fluid (SF) samples from patients with rheumatoid arthritis (RA) contained extracellular mitochondrial DNA (mtDNA) or the oxidatively damaged DNA adduct 8-hydroxy-2'-deoxyguanosine (8-oxodG). Moreover, we correlated the laboratory findings of the patients with RA with their levels of mtDNA and 8-oxodG. SF and plasma samples from 54 patients with RA, SF from 30 non-arthritic control subjects, and plasma from 22 healthy volunteers were collected. The samples were subjected to polymerase chain reaction (PCR) using mitochondrial genomic primers, and the products were analyzed by SDS–polyacrylamide-gel electrophoresis. The intensities of the PCR-amplified bands were quantified and normalized to a reference sample. Furthermore, the SF samples were assayed by enzyme-linked immunosorbent assay for 8-oxodG. Extracellular PCR-amplifiable mtDNA was detected in the SF of 38 of 54 (70%) patients with RA, but not in any of the SF controls. PCR-amplifiable mtDNA was detected in the plasma of 30 of 54 (56%) of patients with RA and in 6 of 22 (27%) of the healthy volunteers. The levels of mtDNA in the plasma and SF samples of patients with RA were significantly higher (P < 0.0001) than in the respective control samples. The presence of both mtDNA and 8-oxodG in SF was significantly correlated with the presence of rheumatoid factor in the patients with RA. Extracellular mtDNA and oxidized DNA were detected in the SF of the great majority of patients with RA, but were absent or present at low levels in the control SF. These findings indicate that endogenous nucleic acid compounds might participate in joint inflammation by activating immune cells in the joints to produce proinflammatory cytokines. The mitochondria of human cells contain supercoiled double-stranded circular genomes that comprise 16.5 kilobases of mitochondrial DNA (mtDNA). mtDNA is similar to bacterial DNA and distinct from eukaryotic nuclear DNA (nDNA) in that it is not protected by histones and contains CpG motifs in which the cytosine is unmethylated. Bacterial DNA that contains CpG motifs has been shown to have powerful immunostimulatory effects [1, 2], and we have shown that bacterial DNA containing unmethylated CpG motifs induces arthritis . Reactive oxygen species (ROS), such as hydroxyl radicals, superoxide radicals, and hydrogen peroxide, are generated from aerobic metabolism , mitochondrial oxidative phosphorylation , and from other sources, such as neutrophils and macrophages . mtDNA is more susceptible to ROS-induced damage than nDNA  because the mitochondrion lacks an effective system for repairing oxidative lesions. Unrepaired damage to mtDNA leading to mutations and energetic dysfunction has been linked to several debilitating diseases, such as diabetes mellitus, neoplasias, and Parkinson's and Alzheimer's diseases. When injected intra-articularly in mice, purified mtDNA induced arthritis whereas nDNA from the same cells did not (LV Collins, S Hajizadeh, E Holme, I-M Jonsson, A Tarkowski, unpublished work). By the same token, oxidatively damaged DNA, irrespective of its origin, has the capacity to induce arthritis (LV Collins, S Hajizadeh, E Holme, I-M Jonsson, A Tarkowski, unpublished work). The release of damaged nuclear and mtDNA from cells during tissue damage might therefore have an initiating or potentiating role in inflammation. We examined whether immunostimulatory mtDNA was involved in human arthritis by assaying the levels of extracellular mtDNA in plasma and synovial fluid (SF) samples from patients with rheumatoid arthritis (RA) and from control subjects using amplification by polymerase chain reaction (PCR) with mitochondrial genomic primers. We also investigated whether the levels of 8-hydroxy-2'-deoxyguanosine (8-oxodG), which is a marker for oxidative DNA damage, differed in the joints of patients with RA and control subjects. Our results indicate highly significant differences in the SF levels of both 8-oxodG and mtDNA between patients with RA and healthy subjects, which suggests that these two DNA species might participate in joint inflammation. The plasma and SF samples were collected simultaneously with informed consent from 54 patients who were undergoing diagnostic or therapeutic joint aspirations at the Sahlgrenska University Hospital, Göteborg, Sweden. SF was obtained by transdermal arthrocentesis. Before the puncture, the skin surfaces of the joint were thoroughly cleaned with a mixture of 0.2% chlorhexidine and alcohol. To avoid contamination by bacteria or bacterial products in the aspirated material during the procedure, sterile equipment, such as needles, syringes and disposable gloves, were used. SF was aspirated in a dry sterile syringe and transported immediately into sodium citrate (0.129 M; pH 7.4). The same precautions were taken during plasma sample collections from both the patients with RA and the 22 healthy volunteers. The average age (mean ± SE) was 50 ± 1 years for females, and 56 ± 4 years for males. The control SF samples were collected post-mortem from 30 control subjects (predominantly traffic accidents) who donated bone marrow for transplantation purposes. These donors had no history of joint complaints, nor was any joint pathology observed when the joint was opened. The samples were centrifuged at 500 g for 10 minutes, then at 2000 g for 10 minutes, and the supernatants were boiled for 10 minutes. After centrifugation in a microfuge (11,000 g for 15 minutes at 4°C), the supernatants were analyzed by PCR with the human mtDNA-specific primers 5 '-GCTCTCCATGCATTTGGTAT-3' (forward primer) and 5'-TTGTATTGATGAGATTAGTA-3' (reverse primer). The reaction mixture contained the forward and reverse primers (each at 0.4 μM) in a total volume of 25 μl containing 2.5 μl of extracted SF in 10 mM Tris-HCl, pH 8.3, 50 mM KCl, 4.0 mM MgCl2, 0.2 mM dNTPs (dATP, dCTP, dGTP, and dTTP), and 1.25 U of Taq DNA polymerase (AmpliTaq Gold; Perkin Elmer, Branchburg, NJ, USA). All of the SF samples were subjected to 45 cycles of amplification, each consisting of a 12-minute hot start at 94°C, denaturation at 94°C for 30 seconds, annealing at 60°C for 30 seconds, and extension at 72°C for 1 minute. Samples showing a PCR product of 453 base pairs (bp) on silver stained SDS–polyacrylamide-gel electrophoresis (SDS–PAGE) gels were considered positive for the presence of mtDNA. The detection limit of the PCR assay for mtDNA was about 100 pg/ml. After amplification, the PCR products were subjected to SDS–PAGE in 4–20% Tris-borate-EDTA gels (Labora AB, Sollentuna, Sweden) and the bands were revealed by silver staining. The gels were scanned and the intensity of each band on the gel was analyzed with IPLab Gel software (BioSystematica, Plymouth, UK). The value obtained for the 676-bp band in each gel was used as the cutoff point for positive signals. Purified mtDNA from human muscle mitochondria was used as a positive control for the PCR. The negative control consisted of the reaction mixture without template, which was used to check for the presence of contaminating DNA in the PCR reagents and other components. In addition, mtDNA could be amplified from mtDNA-negative samples to which small amounts of purified mtDNA had been added, confirming that the plasma and SF samples did not contain PCR-inhibitory components. Because PCR assays are highly sensitive to trace contaminants, strict measures were taken to avoid artefacts. These precautions included the use of sterile equipment and dedicated pre-PCR and post-PCR rooms, pipettes, laboratory coats, disposable gloves and waste containers. To prevent any contamination from aerosols, pre-sterilized filter tips were used (SDS, Falkenberg, Sweden) in all of the PCR procedures. A PCR hood was used and the pipettes, tips, PCR tubes and trays were irradiated with ultraviolet light 30 minutes before either DNA extraction or preparation of the PCR reaction mixtures. Differences between the groups in the levels of PCR-amplified mitochondrial DNA in plasma and SF, and in the levels of 8-oxodG in SF, were analyzed for statistical significance with the Mann–Whitney test. Correlation between laboratory features of the patients with RA and the occurrence of mtDNA and oxidized DNA were analyzed for statistical significance with the Mann–Whitney test, the χ2 test and Fisher's exact test. The optimum concentration of MgCl2 for PCR amplification of mtDNA was determined by analyzing PCR reactions containing various concentrations (2.0, 3.0, and 4.0 mM) of MgCl2. In addition, serial dilutions (1:5, 1:20, and 1:100) of plasma and SF samples were amplified by PCR to detect the presence of inhibitors of Taq polymerase. Optimal PCR conditions were established by using plasma or SF samples diluted 1:20 and with a concentration of 4.0 mM MgCl2. The results of a typical PCR analysis of plasma and SF samples are shown in Fig. 1. Positive and negative samples from SF and plasma samples, as well as positive and negative controls for the PCR, were included in this gel for comparative purposes. The samples were judged to be positive or negative on the basis of the intensity value for the PCR product on the gel (as assessed by the IPLab Gel software) relative to the intensity value for the 676-bp band in the molecular mass standard. Polymerase chain reaction (PCR) amplification of mtDNA from plasma and synovial fluid (SF) samples of patients with rheumatoid arthritis (RA). SDS–polyacrylamide-gel electrophoresis of PCR-amplified mitochondrial DNA (mtDNA) fragments (453 bp) of plasma and SF of five patients with RA. A semi-quantitative method was used to assign the PCR product intensities to positive or negative categories. An arbitrary cutoff point was assigned that was relative to the intensity of the 676-bp band (arrow) of the molecular mass marker on the gel. Lane 1, molecular weight marker; lane 2, water only (control); lane 3, plasma from patient 1 (plasma-1); lane 4, SF from patient 1 (SF-1); lane 5, plasma-2; lane 6, SF-2; lane 7, plasma-3; lane 8, SF-3; lane 9, plasma-4; lane 10, SF-4. The samples in lanes 11 (plasma-5) and 12 (SF-5) were spiked with 10 ng of purified mtDNA. The percentage of patients with PCR-amplifiable mtDNA in their SF (Fig. 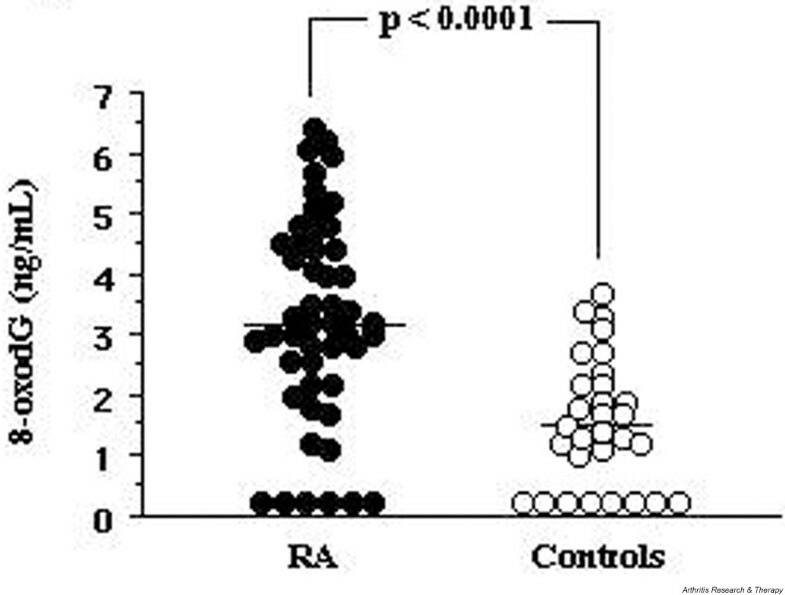 2) was significantly higher in the RA group than in the control group (P < 0.0001). A comparison of mtDNA-positivity in plasma samples from patients with RA (30 of 54, or 56% positive) and healthy volunteers (6 of 22, or 27% positive) showed that mtDNA was detected more often in the group of patients with RA (P = 0.025; Fig. 2). These results show that patients with RA can be easily distinguished on the basis of positive PCR results for mtDNA in the SF. Percentages of rheumatoid arthritis (RA) and control subjects with mitochondrial DNA (mtDNA) amplifiable by polymerase chain reaction (PCR) in their plasma or synovial fluid (SF). Individual positivities are based on the detection of the 453-base-pair mtDNA-specific PCR product in the plasma or SF samples. 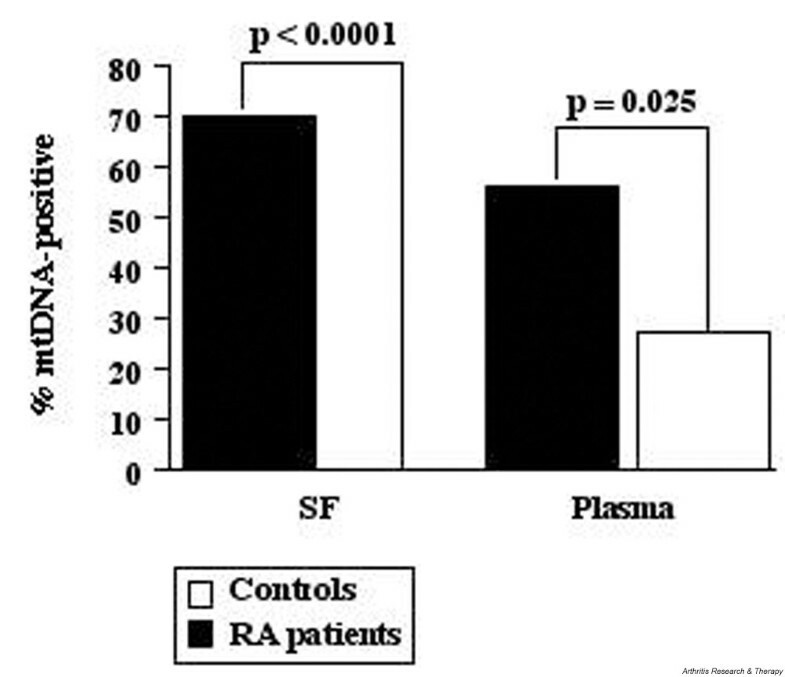 Patients with RA, n = 54; control (SF), n = 30; control (plasma), n = 22. To establish a semi-quantitative mechanism for assigning the patients to various categories, we set the intensity of the 676-bp band of the molecular mass marker on each gel as the arbitrary cutoff point (Fig. 1, arrow). The intensity of this band corresponded to the intensity of the PCR product when about 14 ng of PCR-purified mtDNA was amplified by PCR from control SF. The PCR analysis revealed the presence of extracellular mtDNA in the SF of 38 of 54 (70%) of the patients with RA that were included in the study, whereas none of the control SF samples was positive for mtDNA. The results of this study suggested that the patients with RA (Fig. 3) can be divided into four major categories according to the relative intensities of their PCR-amplified bands: category I (plasma+/SF+) is the largest group and contains 26 patients (48%) with strong mtDNA signals in both the plasma (PL) and SF; category II (plasma+/SF-) is represented by 4 patients (7%) who had PCR-amplifiable mtDNA in the plasma but not in the SF; category III (plasma-/SF+) contains 12 patients (22%) with mtDNA in the SF but not in the plasma; and category IV (plasma-/SF-) includes those 12 patients (22%) who had no detectable mtDNA in either plasma or SF. Comparisons of samples positive for mitochondrial DNA (mtDNA) (based on PCR fragment intensities on SDS–polyacrylamide-gel electrophoresis [SDS–PAGE]) in plasma and synovial fluid (SF) samples both from patients with rheumatoid arthritis (RA) and from controls. The arbitrary cutoff threshold is based on comparisons between the intensities of PCR-amplified mtDNA fragments and the 676-bp band on each SDS–PAGE (see Fig. 1). Data points above the cutoff threshold indicate mtDNA-positive samples, and data points below the cutoff threshold indicate mtDNA-negative samples. Correlations of the relative band intensities between plasma and SF samples from individual patients are indicated by lines joining the corresponding data points. The samples from patients with RA (n = 54) are divided into four categories (see the results section): I, PL+/SF+; II, PL+/SF-; III, PL-/SF+; IV, PL-/SF-. The control samples were from two different groups of subjects. The control plasma (PL) samples were obtained from healthy volunteers, and the control SF samples were recovered at autopsy from non-arthritic patients. Statistically significant differences in band intensities were noted between patients in categories I and IV (P < 0.0001), and between the patients in categories II and III (P = 0.0036). The mean level of 8-oxodG in the RA–SF samples was 3.2 ng/ml, and 41 of 49 patients with RA had more than 1.5 ng/ml 8-oxodG in their SF. In contrast, the mean 8-oxodG level in the control SF group was 1.5 ng/ml, and 16 of 30 of the control subjects had significant amounts of 8-oxodG in their SF (Fig. 4). The mean 8-oxodG level in the joints of patients with RA was significantly higher (P < 0.0001) that in the joints of the non-arthritic control subjects (see Fig. 4). Levels of 8-oxodG in the SF of patients with rheumatoid arthritis (RA) and of control subjects. The SF samples from patients with RA (n = 49) and non-arthritic controls (n = 30) were assayed by competitive ELISA for 8-oxodG content (ng/ml). The horizontal bars show the mean 8-oxodG levels for each group: 3.2 ng/ml for the RA group; 1.5 ng/ml for the control group. The laboratory findings for the patients with RA used in this study are shown in Tables 1 and 2. There was no significant correlation between the presence of mtDNA in the SF and parameters such as erosivity or extra-articular manifestations (Table 1). Rheumatoid factor (RF) was detected with significantly higher (P = 0.043) frequency in patients that had mtDNA-positive SF than in patients whose SF samples were mtDNA-negative. In addition, there were no significant correlations between the presence of mtDNA in the SF and C-reactive protein, leukocyte count platelet counts, disease duration, or medication used (Table 1). There was a significant (P < 0.0007) correlation between the level of 8-oxodG and RF positivity. In contrast, no significant correlation was found between the presence of 8-oxodG and other clinical or laboratory parameters (Table 2). RA, rheumatoid arthritis; RF, rheumatoid factor; ExART, having extra-articular manifestations of RA; CRP, C-reactive protein; TPC, thrombocyte particle count; LPC, leukocyte particle count, n.d., not done. RA, rheumatoid arthritis; 8-oxodG, 8-hydroxy-2'-deoxyguanosine; RF, rheumatoid factor; ExART, having extra-articular manifestations of RA; LPC, leukocyte particle count. Although DNA from specific viral (for example HTLV-1) , bacterial (for example Borrelia, Chlamydia spp. , Salmonella  and Yersinia ) sources has been detected in the joints of arthritis sufferers, there is considerable debate as to whether these nucleic acids have a direct role in inflammation and joint destruction [11–13]. DNA containing unmethylated CpG motifs has been reported to have immunostimulatory properties [14–16], and the presence of this type of DNA in joints has been linked with arthritides in mice  and humans . Moreover, it has been suggested that CpG DNA might have a role in other human autoimmune diseases such as systemic lupus erythematosus . mtDNA has similarities to bacterial DNA and differs from eukaryotic nDNA in that it is not protected by histones and has a higher frequency of unmethylated CpG motifs. We have shown that purified human and murine mtDNAs, as well as PCR-amplified fragments of the human mitochondrial genome, induce arthritis in mouse joints when injected intra-articularly (LV Collins, S Hajizadeh, E Holme, I-M Jonsson, A Tarkowski, unpublished work). In the present study we detected the presence of extracellular, PCR-amplifiable mtDNA in most (78%) clinical plasma and SF samples from patients with RA that we studied. There were notable differences between the numbers of patients with mtDNA in their plasma (P = 0.025) and SF (P < 0.0001) compared with the plasma and SF samples from the respective controls. Relatively high mtDNA-specific PCR band intensities were obtained for the SF samples from patients with RA (Fig. 3), which strongly suggests the presence of localized inflammation leading to cellular destruction. Interestingly, the patients with detectable levels of mtDNA in the SF also tended to have significant levels of mtDNA in their bloodstream (Fig. 3, category I). In contrast, patients who lacked detectable free mtDNA in their SF usually lacked mtDNA in their blood (Fig. 3, category IV), and the plasma samples from healthy volunteers contained little or no mtDNA. Thus, patients who have continuing joint inflammation that is accompanied by elevated levels of mtDNA tend to have free mtDNA in their bloodstream, either because they are excreting free mtDNA or they have concomitant systemic inflammation. We further investigated whether a correlation existed between the presence of free mtDNA and 8-oxodG in the SF of patients with RA and the appearance of other laboratory parameters, such as RF, erosivity, and extra-articular manifestations. The presence of both mtDNA (P = 0.043) and 8-oxodG (P < 0.0007) was significantly correlated with the presence of RF, a diagnostic and prognostic marker, in the patients with RA. No obvious correlation was found between mtDNA detected in the SF and markers of disease severity, such as erosivity, extra-articular manifestation, C-reactive protein, leukocyte particle counts, thrombocyte particle counts, disease duration, or medication used. Because the injection of as little as 1 μg of mtDNA induced arthritis in mouse joints (LV Collins, unpublished work), we performed a theoretical calculation to investigate whether an equivalent DNA load might be found in inflamed human joints. An average human cell contains approximately 10 fg (10-15 g) of mtDNA. Given that an inflamed human RA joint contains about 107 cells/ml in a total SF volume of 10 ml, we can estimate the total mtDNA content of the inflammatory cells in the joint as about 1 μg. This calculation is rather crude and probably an underestimate, because the concentration of cells in the SF and the levels of cell death vary with the severity of arthritis and the use of cytotoxic drugs. Nevertheless, it does demonstrate that inflamed joints contain more than enough mtDNA to induce the type of inflammation seen in mtDNA-injected mouse joints. It is also worth emphasizing that the process of inflammation in RA joints is dynamic, with the infiltration of new inflammatory cells, the death of resident cells, and the continuous secretion of DNA adducts, all of which contribute to the inflammatory outcome. High systemic levels of oxidatively damaged DNA, in particular 8-oxodG, are generally viewed as indicators of cellular injury , and high local levels have been associated with neuroinflammatory disease, for example in the brain tissues of patients with multiple sclerosis . Most interestingly, conditions of high oxidative stress have previously been reported for the rheumatoid joint [21, 22]. In this study, 8-oxodG was found to be present in the SF from 41 of 49 patients with RA but 16 of 30 control subjects had significant amounts of 8-oxodG in their SF (P < 0.0001). It therefore seems that 8-oxodG is a marker of inflammation in the joints of patients with RA. Because the presence of 8-oxodG residues in DNA strands, for example as a result of damage by free radicals, is detrimental to cells, these adducts are normally excised by repair mechanisms and excreted. When oxidative damage to DNA is excessive, repair is not possible and apoptotic mechanisms are induced. Although both nDNA and mtDNA undergo oxidative damage , it is intriguing to note, first, that mtDNA incurs far higher free radical damage than nDNA [23, 24] owing to its proximity to the respiratory chain, a lack of histones, and less efficient DNA repair systems; and, second, that mitochondria are instrumental in signaling cellular apoptosis in response to overwhelming oxidative stress [25, 26]. Furthermore, a recent study has demonstrated that oxidative stress in the RA joint not only damages the cellular DNA, but also suppresses the DNA mismatch repair system , which would increase the overall load of DNA adducts in the joint and exacerbate the disease. Most patients who had mtDNA-positive SF also had significant amounts of 8-oxodG in their SF, indicating that oxidatively damaged DNA might have a role in inflammation. In this study we found that most patients with RA had PCR-amplifiable mtDNA in their joints. We propose that endogenous mtDNA released from cells undergoing necrosis activates phagocytes to produce tissue-destructive enzymes and cytokines, which contribute to the inflammatory process. It seems likely that a combination of high levels of reactive oxygen intermediates and the presence of DNA adducts exacerbate cellular damage in inflammatory loci, thus creating a vicious circle of inflammation and cell destruction and an increased release of endogenous, proinflammatory DNA. In the particular case of arthritis, therapies might be envisaged that reduce overall oxidative stress while minimizing the load of extracellular mtDNA in joints. We thank Dr M Bokarewa for collecting plasma and SF samples and for characterizing the clinical features of the patients with RA. This work was supported by grants (to LVC) from the Swedish Association against Rheumatism, the Swedish Inflammation Network, the Nanna Svartz Foundation, the King Gustav V foundation, the Swedish Medical Research Council, and the EU Commission Biotechnology Program (BIO4CT97-5130).